Burj Al Arab suite's deluxe bathroom, Dubai, UAE. 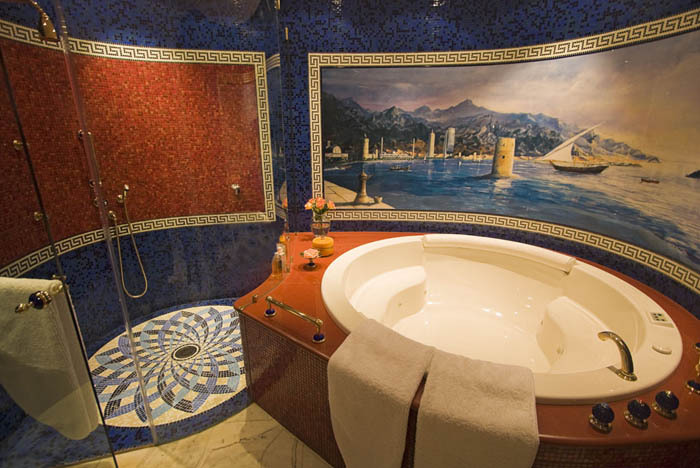 Caption: Burj Al Arab suite's deluxe bathroom, Dubai, UAE. Comments: Luxurious bathroom (washroom) in suite of Burj Al Arab hotel in Dubai, UAE. This is the hotel shaped like a sail. Its 'standard' rooms cost $1500 US and up per night. At 321 m (1,053 ft), it is the third tallest building in the world that is used exclusively as a hotel. The Burj Al Arab stands on an artificial island 280 m (920 ft) out from Jumeirah beach, and is connected to the mainland by a private curving bridge. Also known as "Tower of the Arabs" or "Arab Sail."